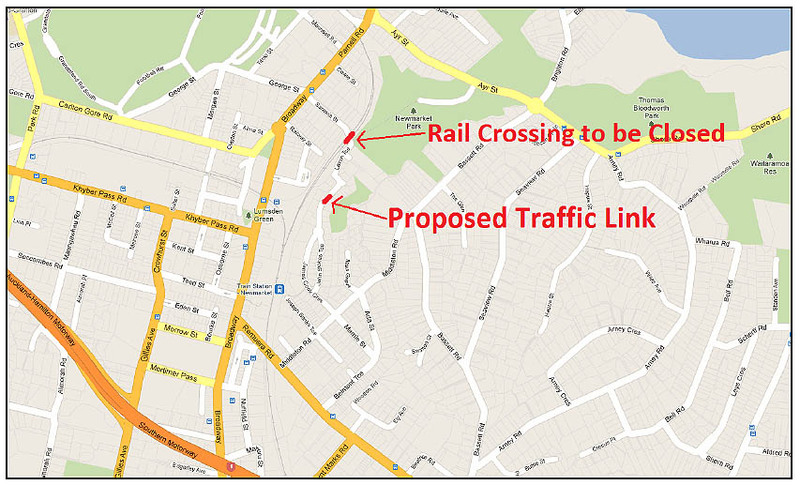 Auckland Transport (AT) will close the railway level crossing connecting Sarawia Street and Laxon Terrace in Newmarket. A bridge will replace the crossing, linking Laxon Terrace with nearby Cowie Street. Improve safety at the busiest train crossing in the country. Allow greater frequency of services. Increase efficiency and effectiveness of rail operations. Create a quieter local environment by removing the need for crossing bells. 2012 - Public consultation began. 2013 - Analysis of crossing options and selection of preferred option (Cowie Street bridge). 2014 - Feedback from residents and key stakeholders incorporated into bridge design. 2015 - Concept design of preferred option complete. Notice of Requirement and resource consent applications lodged with Auckland Council (October). Public notification of consents (November). 2016 - Hearing and formal consent decision (June). Environment Court appeal and mediation with appellants. 2017 – Resolution of Environment Court appeal (March). Detailed design. (May - July). Construction tender (August). Construction starts (October). 2018 - Completion of bridge and road works (March/April). Closure of crossing, removal of crossing infrastructure and relocation of train signals by KiwiRail (April/May). Cowie St road and footpath renewals work (late 2018). Newmarket level crossing update 30 is available to download. Newmarket level crossing update 29 is available to download. Newmarket level crossing update 28 is available to download. Newmarket level crossing update 27 is available to download. Newmarket level crossing update 26 is available to download. Newmarket level crossing update 25 is available to download. Newmarket level crossing update 24 is available to download. Newmarket level crossing update 23 is available to download. Newmarket level crossing update 22 is available to download. Newmarket level crossing update 21 is available to download. Newmarket level crossing update 20 is available to download. Newmarket level crossing update 19 is available to download. Newmarket level crossing update 18 is available to download. Newmarket level crossing update 16 is available to download. Newmarket level crossing update 15 is available to download. Newmarket level crossing update 14 is available to download. Newmarket level crossing update 13 is available to download. Newmarket level crossing update 12 is available to download. The presentation from the February Newmarket level crossing community liaison group meeting is now available. Newmarket level crossing update 11 is available to download. Newmarket level crossing update 10 is available to download. Newmarket level crossing update 9 is available to download. Newmarket level crossing update 8 is available to download. Newmarket level crossing update 7 is available to download. Newmarket level crossing update 6 is available to download. Newmarket level crossing update 5 is available to download. Newmarket level crossing update 4 is available to download. Newmarket level crossing update 3 is available to download. Newmarket level crossing update 2 is available to download. Newmarket level crossing update 1 is available to download. The presentation from the December Newmarket level crossing community liaison group meeting is now available. We have released the latest road safety audit for the project. Read the safety audit and other project documents. Draft Consent Management Plans for the project construction works have been prepared, with other consent management plans to follow. We have reached an agreement with the Cowie Street Residents Association over the bridge and road to be built to connect Laxon Terrace and Cowie Street. We held a community liaison meeting to brief affected residents on the detailed plans for building the bridge, managing the new road, establishing cycle and walking facilities, planting, lighting and environmental protection. The Environment Court appeal has now been resolved, and detailed design is being concluded. We have prepared a draft communications plan on how AT will communicate with, and manage feedback from, stakeholders throughout this final design stage. Comments on the plan's content are open until 19 June. The independent planning commissioners recommendation for a bridge to replace the Sarawia Street level crossing has been appealed. Find out more on the project updates page. AT has received approval from independent planning commissioners for the construction of a bridge to replace Sarawia Street level crossing. AT has 30 working days to review and formally accept the recommendation. On 29 April, AT held a community meeting to present the bridge design for which we will apply for consents to build. The design was developed using feedback from local residents during consultation in late 2014. Find out more about the public engagement process. The AT Board has upheld its decision to proceed with the Cowie Street overbridge option as a replacment for the Sarawia Street level crossing. The Board has published an independent high-level review of options along with comments from it's Chairman, Dr Lester Levy. The Newmarket level crossing is located 2 minutes northeast of Newmarket centre, where Sarawia Street meets Laxon Terrace. Closing the level crossing will enable AT to increase the frequency of train services to Parnell Station, and to increase the efficiency and resilience of Metro rail services on the wider network. In 2013, AT undertook analysis and made a decision on how Laxon Terrace will be accessed once the level crossing on Sarawia Street (known as Newmarket level crossing) is closed. A road-over-rail bridge linking Cowie Street with Laxon Terrace was chosen as the solution. Provides the safest access for all road users, compared to other options. Accommodates all modes of transport, including pedestrians and cyclists. Provides opportunities for improved connectivity to Newmarket Park and a planned cycling and walking route linking Parnell and Newmarket via the old Parnell rail tunnel. Has the least disruption due to the main work site being located on railway land, away from the majority of residential properties. See a plan of the current design (PDF 132KB). Two-lane road access into and out of Laxon Terrace. Narrow road width, textured road surfaces, and chicanes (at end of Cowie Street and along the new road) support a low-speed environment. Directed LED lighting along the new bridge and road to ensure a well-lit environment while minimising light-spill outside the road corridor. Tree pits and vegetated swale provide an environmentally-friendly treatment for stormwater run-off. Clear sightlines with no entrapment spaces. Physically separated from Newmarket Park by fencing and/or height differentials (except the existing Laxon Terrace entrance to the park). Construction of the bridge will require significantly deep earthworks. Geotechnical testing has been undertaken at every proposed bridge pile location to give precise geological information and a full peer review and quality process has been undertaken. This will continue throughout construction, including pile proof-load testing. The crossing design minimises the impact on Newmarket Park and maintains pedestrian and cycle access. The path down to the park will remain with an adjusted alignment. The existing rest area at top of path to Newmarket Park will be recreated, along with seating. The Pou will be relocated in consultation with artist, Renata Blair. AT is partnered with iwi and has consulted with Mana whenua throughout the project. Patterning on concrete bridge abutments beneath bridge. Following discussions with Mana whenua and AT stormwater specialists, the raingarden in the original design will be replaced with 2 tree pits and filters placed within new chicanes in the road corridor. Same level of stormwater treatment without requiring the area in Newmarket Park. Can accommodate all stormwater resulting from the new impervious surfaces. Reduction of sewer overflows (approximately 50%) at Cowie Street by conveying stormwater from the road to the vegetated swale. Allow more vegetation & trees to be retained compared to the raingarden option. Where possible, stormwater will be removed from the combined sewer network. All captured stormwater will be treated to a level in line with Auckland Council’s TP10 guidelines. The proposed change from raingarden to tree pits will be submitted to Auckland Council’s Team Leader Central Monitoring for approval at completion of design. To avoid seepage of treated stormwater into the surrounding soils and to mitigate stability concerns for the adjacent slopes, all treated stormwater will be captured and conveyed into the existing stormwater pipe network. The KiwiRail access path is expected to be utilised for swale maintenance. AT initially investigated speed tables, but chicanes were preferred as a result of road safety auditor and other traffic engineering feedback. A chicane at the end of Cowie Street is required as part of the measures to retain the existing poplar tree located there. The 2 chicanes along the top of Newmarket Park are required to comply with the traffic engineering advice of our designers Opus, and the findings of the road safety auditor. Traffic calming in those locations was a feature of the design presented to Auckland Council during the Notice of Requirement and Resource Consent hearing. Accordingly, approval was granted on the expectation that traffic calming would be included. At the May 2017 Community Liaison Group, it was suggested that cobbled, textured surfaces such as used near the Auckland War Memorial Museum may be effective. However, upon investigation, we do not believe this would be sufficiently effective on the relatively long stretch of straight road to be built. Ensure as many existing trees as possible are retained, especially the large poplar at the end of Cowie St. A timber boardwalk will help protect the root network. Retain the existing ambience of the street with tree-planting and lighting adjustments. To save duplication of scheduled renewal work, and the associated disruption to residents’ access, we will do the mitigation work on Cowie St as part of AT maintenance works programme, separate to this project. Specific timing is based on the maintenance programme, however, we have agreed to complete these works within 2 years of our agreement with the Cowie Street Residents Association, i.e. by March 2019. The bottom of Sarawia Street by the level crossing will become a cul-de-sac. A turnaround area will be provided, with fencing and planting to indicate the change to the end of the road. There will be a gated, locked maintenance access onto the rail corridor for KiwiRail. No public car parks will be removed from Cowie Street. However, following the purchase of a portion of the current car park for 9 Cowie Street, which will be used for the extension of the road, this private car park will be reduced in size. This will result in a net loss of 4 private car parks once the project is completed. During the construction period, there will be no greater loss of public car parking. Some private car parks at 9 Cowie Street might be briefly impacted during site clearance or resurfacing work. Impacts and timing of these works will be discussed with the affected residents before construction commences. AT understands that the property owner of 9 Cowie Street will be discussing the potential impact of this change with tenants. The loss of car parks was an item discussed during the Auckland Council Notice of Requirement hearing held in 2016. This originally proposed the loss of 4 car parks from Cowie Street’s public parking area as well as from 9 Cowie Street, but this was changed following points raised at the hearing and subsequent design revision. Parking along the length of the bridge and new road will not be permitted. To inform the design, AT undertook traffic counts early in 2012, measuring traffic volumes between the hours of 7am and 9am, 12pm and 2pm, and 4pm and 6pm. The 7-day average traffic volume was 409 for Cowie Street and 425 for Sarawia Street, Laxon Terrace and Youngs Lane combined. The 5-day average (i.e. weekdays only) was 370 for Cowie Street and 381 for Sarawia Street, Laxon Terrace and Youngs Lane combined. Our traffic modelling showed minimal increases to vehicle queues exiting Cowie Street, with a slight increase in queuing times (averaging between 2 and 5 seconds during peak periods) for vehicles turning right. As such, the visibility for cars exiting right from Cowie Street on to Parnell Road is considered an existing issue which is not significantly impacted by the project. However, this has been referred to AT’s traffic safety team to consider whether there is a safety concern currently, or in the future after the project is completed. AT began engagement with residents and community groups in November 2012, holding a public forum at the Parnell Community Centre in December 2012 and encouraging public feedback via a survey on what would replace the crossing. Following a decision in November 2014 by the AT Board to proceed with a bridge linking Cowie Street and Laxon Terrace, local residents were surveyed on 3 bridge options to help determine which design AT would progress. The final bridge design was presented to the public at a community meeting on 29 April 2015. View the Community Liaison Group April meeting presentation (PDF 2.87MB). AT lodged the Notice of Requirement (NoR) and associated resource consent applications for the Cowie Street bridge with Auckland Council in October 2015. Submissions in support or opposition closed on 18 November 2015 and submitters were invited to have their say at a hearing held in front of independent commissioners. Get documents relating to the resource consent application on the Auckland Council website. View the agenda, minutes, and decision documents from the resource consent hearing, 19 - 21 April 2016 (Auckland Council website). AT received the formal approval of the resource consent application to construct the bridge from independent planning commissioners on 17 June 2016 and the AT Board accepted it in August 2016, however, the recommendation was appealed to the Environment Court. In May 2017, the Environment Court appeal was resolved, and detailed design began. Following the Environment Court mediation, AT reached an agreement with the Cowie Street Residents Association (CSRA) over the Cowie Street bridge and connecting road. We held a community liaison meeting on 29 May 2017 to brief affected residents on the detailed plans for building the bridge, managing the new road, establishing cycle and walking facilities, planting, lighting, and environmental protection. View the community meeting presentation (PDF 660KB). To guide how AT will communicate with, and manage feedback from, key stakeholders on the project throughout the detailed design phase, we have prepared a draft pre-construction communication and consultation plan. Read the draft pre-construction communication and consultation plan (PDF 392KB). Feedback on the contents of the plan was open from 29 May until 19 June 2017. We will publish the final version after all feedback is reviewed. Draft detailed design of the road and bridge structure is completed and a road-safety audit and peer review is underway. Further feedback on remaining aspects of the design will be sought from the Waitematā Local Board and residents/property owners. Construction work is scheduled to commence in October 2017 and be completed in March/April 2018. Post-construction works to rehabilitate and further beautify Cowie Street are scheduled to be carried out later in 2018. We will hold regular meetings with community throughout the construction phase. Access to the park from Laxon Terrace will be maintained throughout construction, with traffic management as required. When the project is completed, a new access point from Laxon Terrace to Newmarket Park will be provided. Material excavated from the rail corridor and any other contaminated area within the project works will need to be disposed of at a landfill appropriate to the level of contamination. The nature of the contamination is not expected to require any special treatment during excavation (protective equipment for workers etc.) other than to keep contaminated spoil separate from non-contaminated so it can be removed from site and disposed of appropriately. Should unexpected contaminated materials be encountered during excavation, the project’s Site Management Plan (SMP) addresses the steps to be taken to safely and responsibly manage the material. This plan is a condition of the project resource consent, and is to be certified by Auckland Council before the project works begin. We plan to publish a copy of the SMP on this web page before construction starts. A 4m-wide shared pedestrian and cycling path was one of the options considered, but we decided on a standard road and footpath width due to the combination of additional impact on Newmarket Park land requirements, stakeholder feedback, and the comparatively low volume of cyclists expected. There is an initiative led by the Waitematā Local Board to form a pedestrian and cycling path through the old Parnell tunnel. If built, this will connect with the KiwiRail maintenance access ramp that projects from the observation area of the new road. This ramp has the width and gradient to allow easy adaptation to a shared path should the proposed Parnell tunnel pedestrian and cycling path proceed. This project concentrates on work required to achieve grade separation of the Sarawia Street level crossing (with resulting benefits to safety and rail efficiency) and does not include improvements to the length of Laxon Terrace. However, we have received a request from the Local Board and Laxon Terrace Youngs Lane Residents Group to widen the footpath in Laxon Terrace. AT’s Local Board Delivery team is investigating this request as a separate undertaking. AT has no plans to create a connection to Remuera Road by joining the end of Laxon Terrace to the private road, Furneaux Way. Should this change, it should be noted that any such plans would need to go through a publicly-notified process, similar to that undergone by this project. This option involves construction of a two lane road bridge from Cowie Street to Laxon Terrace. It is the most expensive option under consideration. This option is to create a new low-speed, low volume, access way through Furneaux Way. It is also a less expensive and simpler engineering option. Clear sightlines to be created and maintained and approach visibility a safety priority. Landscaping and paving to be kept in local residential character, and of domestic scale. Will also provide traffic calming, be safely lit and enhance local visual amenity. A traffic safety report on the Furneaux Way option (PDF 1.48MB) was carried out. All options allow sufficient width for emergency and large vehicles e.g.rubbish trucks. Current pedestrian movements through to Furneaux Way are maintained. Furneaux Way and James Cook Crescent will experience a minor rise in traffic volume (refer to Traffic Effects for more information). AT would assume responsibility for maintaining Furneaux Way as a public road. The option proposes deconstruction of a two-lane road and footpath through Newmarket Park connecting Laxon Terrace to Ayr Street. This is a less expensive option than the Cowie Street bridge, but is technically challenging due to ground instability issues. Two-lane road access into and out-of Laxon Terrace and Youngs Lane. Acquisition of Newmarket Park land from Auckland Council will be required. Will result in loss of amenity for Newmarket Park users. An underpass from Sarawia Street was considered previously but dismissed due to construction and cost challenges compared to a bridge. Options for bridges from either Sarawia Street or Cowie Street were previously explored by KiwiRail in 2011, with the Sarawia Street bridge option dismissed due to gradient issues. Options for a road through, and a road around the park have been explored by Auckland Transport. Both roads carry high construction risks due to ground stability and the option for a road skirting the edge of the park was not progressed further. Road Safety Audit - August 2017 (PDF 5MB). Construction Environmental Management Plan (CEMP) (PDF 370KB). Construction Traffic Management Plan (CTMP) (PDF 420KB). Urban Design and Landscape Plan (UDLP) (PDF 13MB). Construction Noise and Vibration Management Plan (CNVMP) (PDF 1.5MB). Tree Management Plan (PDF 1.3MB). Get more background reports and consultation documents.